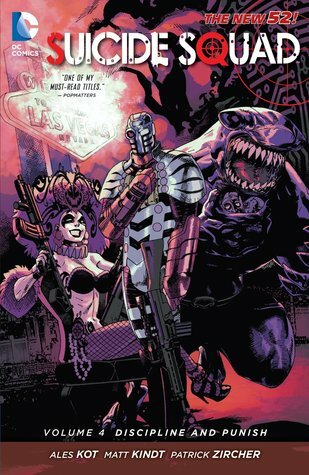 As always Suicide Squad is well drawn, descriptive and reasonably action packed. I once again fell in love with Harley Quinn and her spunky quips and it was an interesting concept to see the Suicide Squad’s progression from being submissive to Amanda Waller; to beating Waller herself into submission. James Gordon Junior’s issues with the Mother complex and reading someone actually wanting to refer to Waller as ‘Mother’, was creepy and left a bad taste in my mouth. No doubt this was how it was meant to feel and it’s great that a graphic novel can produce such a strong emotion. It would be interesting to know how other readers reacted to it. One thing in this volume, which I particularly disliked was the over-use of captions, such as ‘DEADSHOT. SHOOTS THINGS’. At first they were reasonably useful, a re-cap of who’s who, then with the introduction of James Gordon Junior and Cheetah they were snippets of potential back-story to flesh them out as characters, but after that they were unnecessary, irritating and a little ridiculous. Each subsequently unnecessary caption felt like a poor attempt at humour that, spoilt an otherwise entertaining page. Getting several more detailed backstories was fantastic, it had to happen before the series is closed and it has been a long time coming. However I did feel that the inclusion of so many, made it particularly difficult to follow the plot as it became a little bit of a mish-mash. I enjoyed the sudden appearance of Cheetah as she is fascinating as a character. One of the exciting things I take from these graphic novels is that you never know who might show up, who might get their head blown up and who might be (repeatedly) resurrected! Overall I did enjoy the novel, it remains one of my favourite comic book series, but this particular volume is far from the best and certainly not my favourite as an individual novel. The Suicide Squad team had been Waller’s puppies since the day she rolled in, I find it hard to think that they would miss it as much, as the writers of this volume would have us believe. I feel there was much more potential and exploration to be had from this plot and it’s missing something. In the end it felt a little bland and out of character, in comparison to the previous 3 volumes. But I do look forward to seeing what volume 5 will bring and I hope we see more of Cheetah!